From Goodreads: When police recruits Kiera and Tom are ordered to stay away from each other by Sergeant Philips, they can’t help but be drawn back together again. Working side by side Kiera and Tom solve three more unique mysteries. The first deals with betrayal, the second revenge and the third the greatest mystery of all – love. 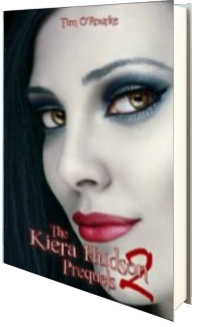 Book Two in the ‘The Kiera Hudson Prequels Series’ set before ‘Kiera Hudson Series One and Two). In this second round of Kiera Hudson Prequels, readers continue to follow Kiera and Tom as they unintentionally find themselves encased in three more unsolved mysteries, unbeknownst to their police Sergeant. And as sparks fly between Kiera and Tom, and the harrowing situations increase, readers easily find themselves transported to the little seaside town, becoming a part of the mystery as it evolves. It’s no secret that Tim O’Rourke is one of my favorite authors, and as his upcoming novel, Flashes, gets ready for release, O’Rourke is working to tie his characters and readers together as the characters novels branch off to their own novels, and I am so epically excited to read Flashes! Having read a adored the Kiera Hudson Series, both one and two, I am excited that O’Rourke is yet again creating a crossover series, tying together characters so seamlessly and allowing readers to experience the full spectrum of awesomeness that is O’Rourke’s writing. Kiera can see what others miss—not in a paranormal manner, but more so like Sherlock Holmes, and these prequels, along with the first set, are definitely a must read, especially if you’re new to Tim O’Rourke’s writing. I definitely suggest picking up this series to whet your appetite. Five stars. This contest is open internationally and will end at 12:01am EST on April 11th. The winner will receive email notification! Please read my giveaway policy and leave me a thoughtful comment!